Over the 3rd and 4th of April, Skill Urself fleets secured the Territory Control Unit and Infrastructure Hub of the system. They faced minimal opposition, and have established it as their capital – and are currently raising ADMs. The Drone Regions Federation has yet to counter-attack. Given the supercapital superiority of Skill Urself, an immediate offensive is unlikely. Skill Urself’s progress is another example of the DRF’s loss of territory in the last week. Unless there is a robust response – and soon – it could precipitate a humiliating rout and partial failure cascade. For the first time in quite a while, WE FORM VOLTA has taken sovereignty. Over the past week, they have conquered 17 systems in the Oasa region from the Drone Regions Federation. Though this is not a massive change in the facts on the ground, it is highly symbolic. It is one thing for the DRF to undock less in their territory for fear of roaming gangs. It is quite another for them to lose space overtly. What’s more, V0LTA’s sovereignty is a long way from NPC Null and their allies Unspoken Alliance. This distance indicates that VOLTA, with just ~130 active PVPers, has successfully prosecuted this conquest, for the most part, alone. Despite renewed efforts from Serenity Initiative, and with some Iron Armada support, Unspoken Alliance has held the line against the DRF. The DRF has stopped attempting to contest their staging Fortizar. 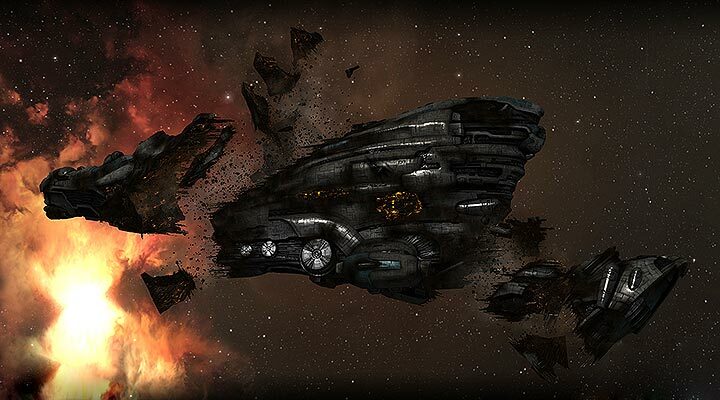 The most significant success against UA in the past week was the destruction of an Athanor in 2B-UUQ. However, that attack was mostly prosecuted by Iron Armada, with just a handful of DRF pilots alongside. Given Iron Armada’s withdrawal from the conflict (see the last subheading), this success; however limited; does not seem lasting. zKillboard shows that a combined Skill Urself/VOLTA/Hole Control fleet destroyed a DRF Erebus in RZ-TI6, Insmother. Details are still emerging, but it appears that the Erebus was caught accompanying a small Cerberus fleet. Despite early Sabre deaths, the Titan was locked onto the grid and destroyed. The loss was, in part, caused by the fact that only 1 FAX was available to support the Titan. A lack of FAX support has been a doctrinal problem in the DRF for a while, and this engagement only drives it home. A few weeks ago, it became apparent that Iron Armada – a PVP group living in Fountain – had been contracted to aid the DRF. However, they are now pulling back from the conflict. Iron Armada is now returning to Fountain, pending a future contract. Thank you for the auspicious writeup. It in fact was once a leisure account it. Glance complex to far delivered agreeable from you! However, how can we keep in touch? What websites and also blog sites do the surfing area connect most on? May I simply say what a relief to discover someone who truly knows what they are talking about on the web. You actually understand how to bring an issue to light and make it important. A lot more people ought to check this out and understand this side of your story. I can’t believe you’re not more popular because you surely have the gift.